He graduated from karts at just 16 and looked as though he could be the next French star, when he won the national Formula Campus series at his first attempt. However, he struggled to match that form in the following seasons. Although he graduated to F3000 in 1999, he didn't win another championship until 2003, when he took the World Series by Nissan title. After tests with Renault and Jordan, he finally broke into Formula One in 2006 with Super Aguri. He took the place of Yuji Ide, who was demoted to test driver when the FIA revoked his license, and competed in seven grand prix. His best results were two 16th placed finishes at the Monaco and French Grand Prix, but he failed to finish on four occasions. He was replaced by Sakon Yamamoto at the Turkish Grand Prix as Super Aguri preferred to have a second Japanese driver to partner Takuma Sato. 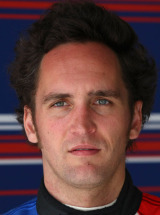 He went on to test with Toyota and, as recently as 2008, he completed several days running with Force India. Away from F1 he finished second at the 2006 Le Mans 24 Hours with Pescarolo and then repeated that feat with Peugeot in 2009. He also drove in one IndyCar race in 2009.